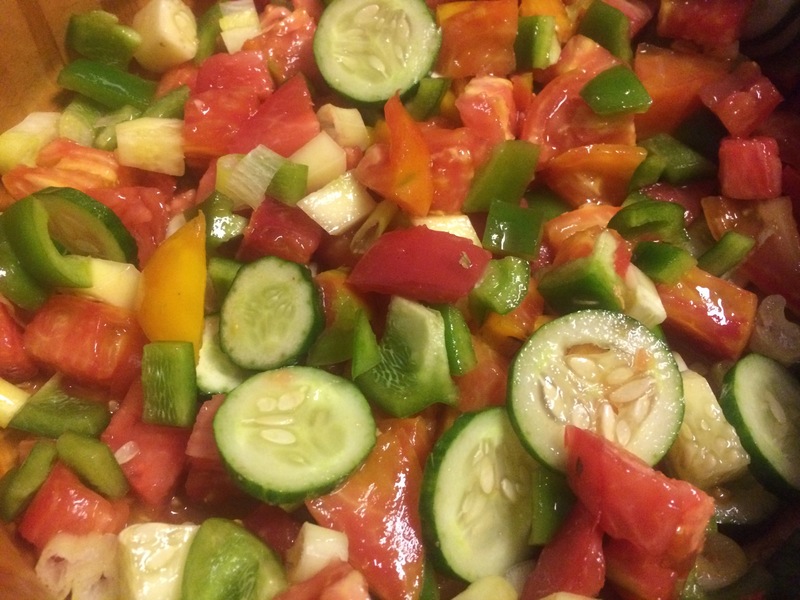 Midsummer + garden = tomato cucumber salads = heaven! 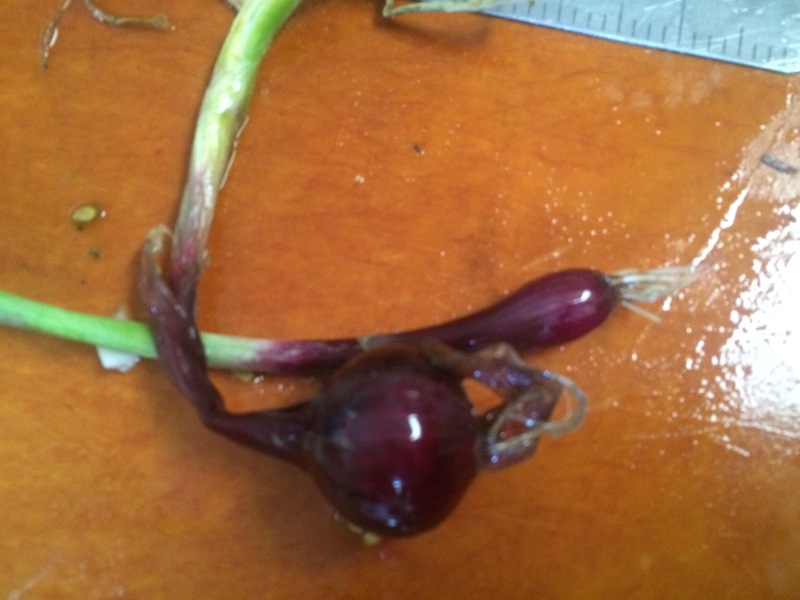 This one got the added benefit of baby red onions from the garden as well. The onions were added as part of a greek feta dressing. This salad makes a great side dish for a light summer dinner, such as with the zucchini kuku below. Toss together the cucumbers, tomatoes and a large pinch of salt in a mesh strainer set over a bowl or the sink. Combine the feta, oregano, garlic and onions in a separate bowl. Add the lemon juice and zest and whisk in the olive oil. 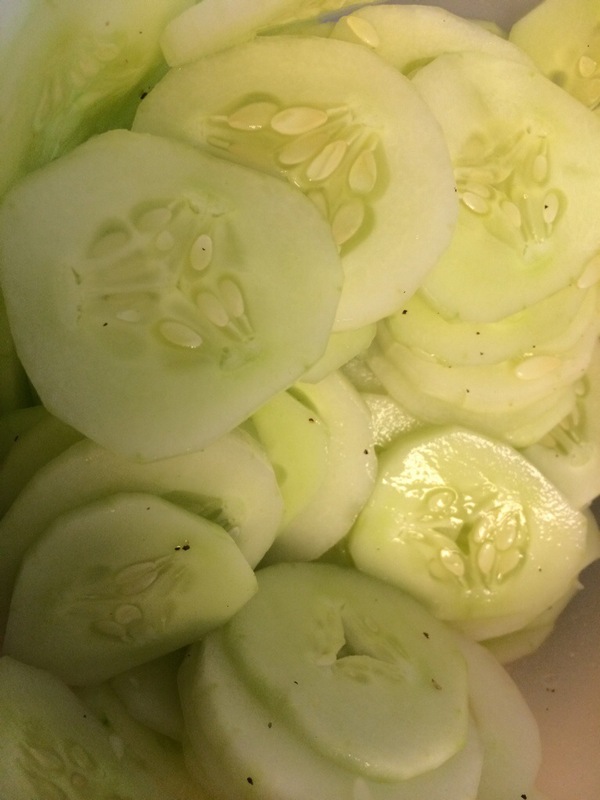 Drain off and discard any water that has released from the cucumbers and tomatoes. Toss together with the dressing. Serve and enjoy! While cucumbers are plentiful in my garden we enjoy refreshing cucumber salads (my son just eats the cukes straight up). I was making Korean grilled chicken skewers for dinner, so of course we needed a Korean-style cucumber salad. By the way, the dakkochi (skewered chicken) was delicious. Click here for the recipe from Closetcooking. I made mine under the broiler in the oven, but other than that, I used their recipe. It is a keeper! Mix soy sauce, vinegar and sugar in a small bowl. Add to the cucumber and toss. Sprinkle with sesame seeds and toss again. Add the green onions, mix and serve. Enjoy! Note: for a crunchier salad, serve immediately. 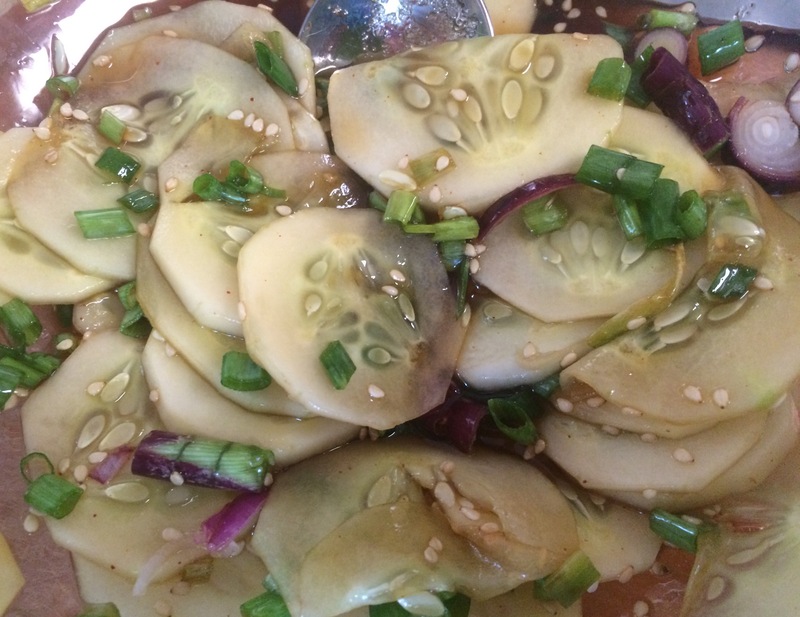 If you want the cucumbers to absorb more of the dressing flavor, let sit 10-15 minutes. I wasn’t feeling well today; I spent much of it asleep. My stomach had been unsettled for a few days, but today food was not appealing to me and I was dizzy. So my plans for our dinner needed to change. I decided eggs would be good for me, and for some reason I was also craving greens. Luckily, I had recently harvested some swiss chard from my garden. And, I happened to have a recipe from for poached eggs with swiss chard from Bon Apetit magazine that I could work from. It was a really interesting recipe, each piece of the dish was separately flavored and spiced – swiss chard with garlic, lentils with lemon and scallions, and cucumbers with za’atar. When put together, the the egg helped bring the flavors together; it worked far better than I imagined they would. Combine lentils, scallions, lemon zest, and 1 Tbsp. lemon juice in a medium bowl; season with salt and pepper. Set aside. 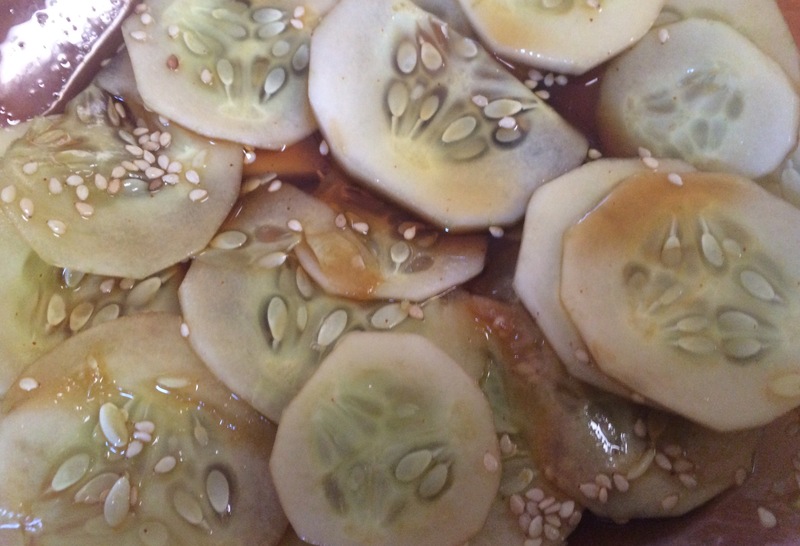 Toss cucumbers with 1 Tbsp. za’atar and remaining 1 Tbsp. lemon juice in a small bowl; season with salt and pepper. Set aside. 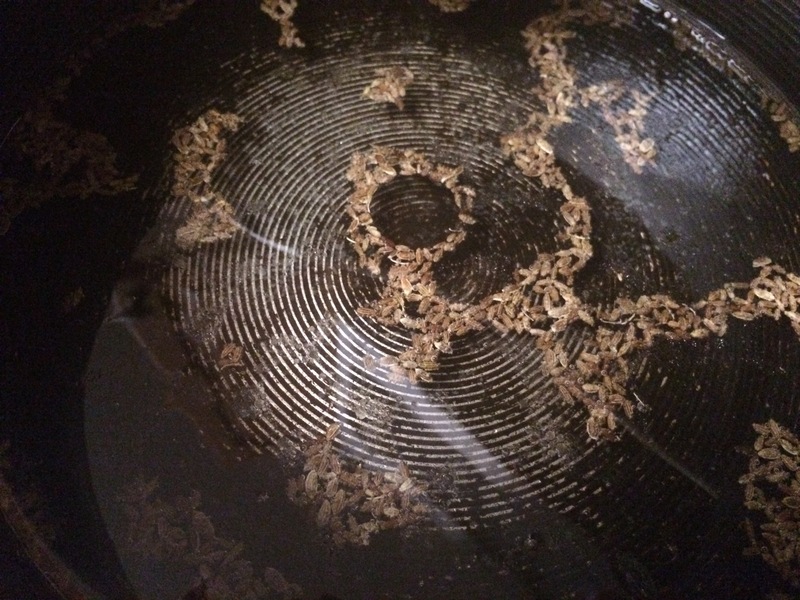 Bring about 2” water to a boil in a large saucepan; reduce heat so water is at a gentle simmer and add vinegar. Crack an egg into a small bowl, then gently slide it into water. Repeat with remaining eggs, waiting until whites are starting to set before adding the next one (about 30 seconds apart). After about 3 minutes, whites should be set and yolks still runny. Using a slotted spoon, transfer eggs to paper towels as they are done. Heat oil in a large skillet over medium. Add Swiss chard by the handful, tossing and letting it cook down a bit before adding more, and cook until tender; season with salt and pepper. Stir in garlic, if using, and set aside. 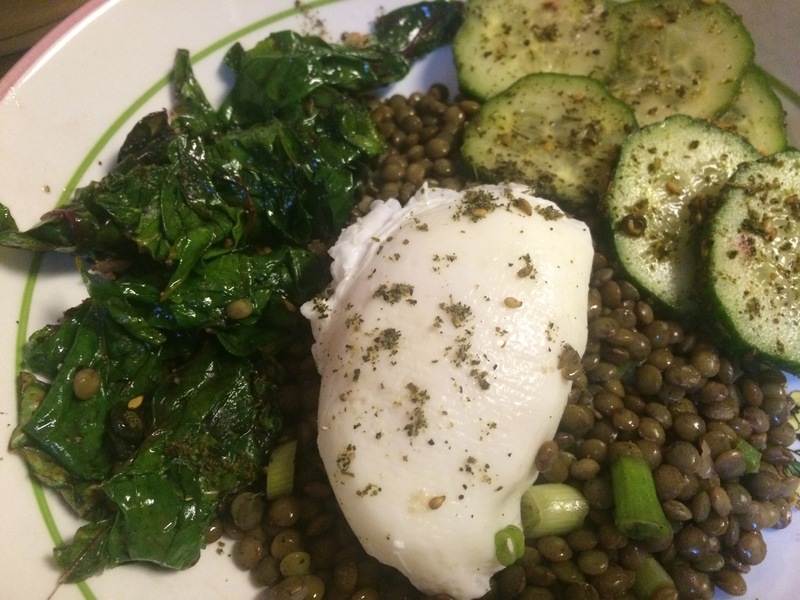 Divide lentils among bowls and top each with some chard, cucumbers, and 1 or 2 poached eggs. Sprinkle with more za’atar. Serve and enjoy! I love Israeli couscous, the texture is so much fun! 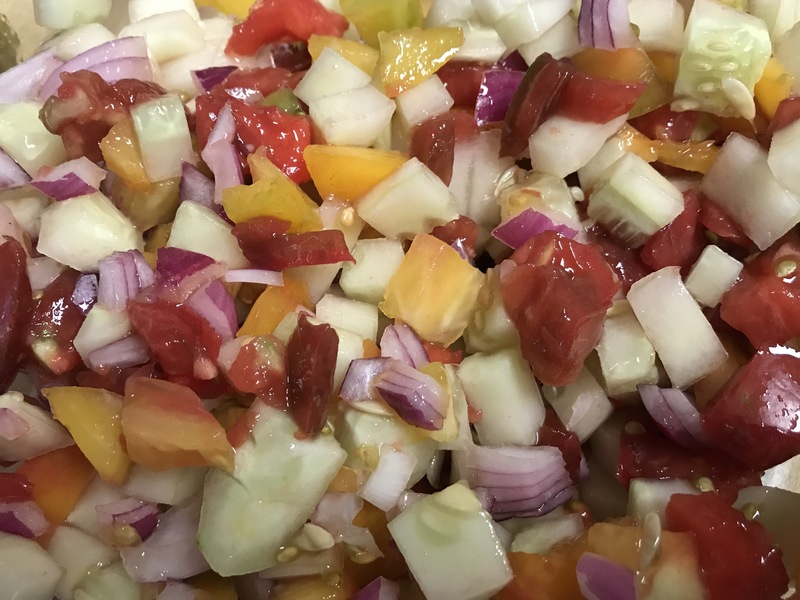 I couldn’t wait to mix in the veggies from my garden to create a salad. I went a little overboard though. I had just harvested some carrots and decided to include those as well. But they were just a bit too crunchy, the texture did not complement the rest of the salad. I thought the crunch would be good, but it was not so pleasant. So, I have not included the carrots in the final recipe. What I did add that were positives, were the corn and the feta. Oh, those were good! 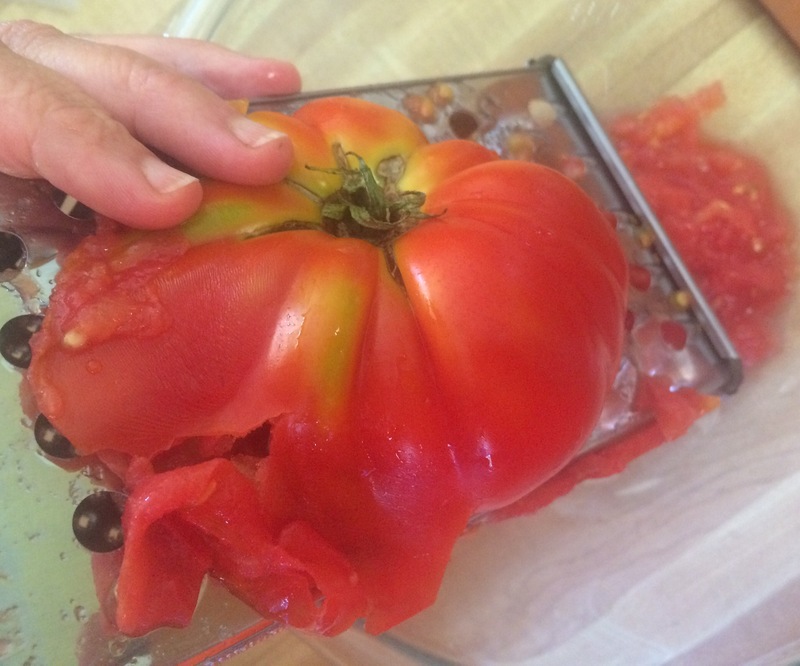 Lesson learned – play with your salads. Some things will work, some won’t, but you won’t know till you try. Mix together all the vegetable in a large bowl. Transfer the couscous to the bowl and toss with the lemon juice, parsley and salt to taste. Add the olive oil, toss together, taste and adjust seasonings. Add the feta cheese and toss. Serve and enjoy! Serves 6 – 8 as a side salad. 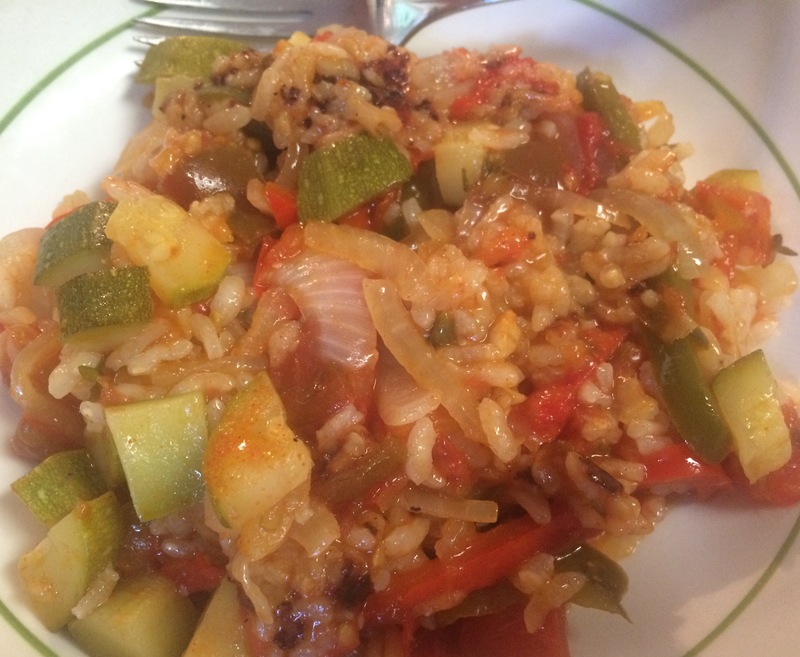 There is a middle eastern restaurant near my daughter’s university…Ali Baba in Newark, DE. It is one of my favorite places to eat. They have many delicious dishes, but somehow, whenever I go there I have to order the fattoush. Fattoush is a middle eastern bread salad, and I think I am addicted to it. 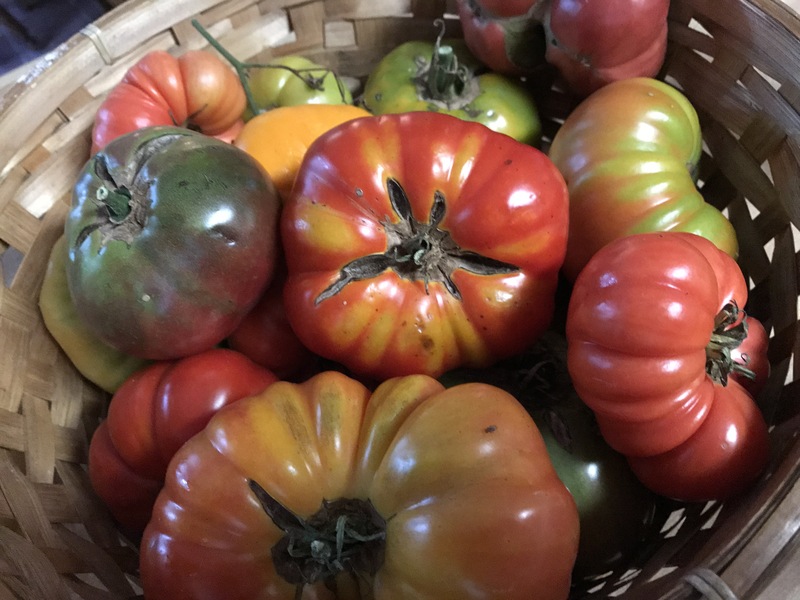 I am not sure if I have mentioned it, but this has not been a great summer for my tomatoes. Good ones have been few and far betwen, but I finally have a few good ones on the counter. I also happened to have some pita bread and one last cucumber from our garden. Time for me to do my own riff on fattoush! I had a lot of lima beans in the fridge that needed to be used. 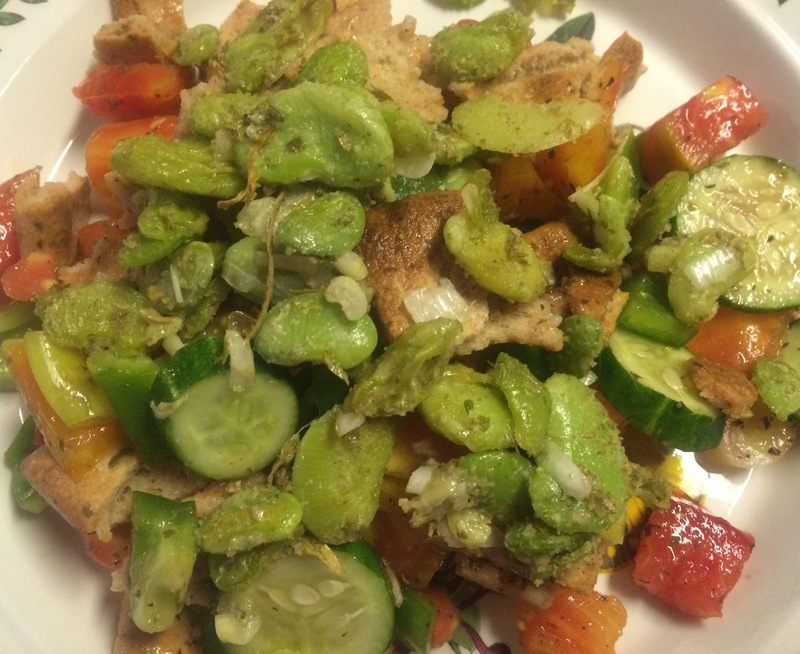 I realized that roasted lima beans would go wonderfully on top of the salad. 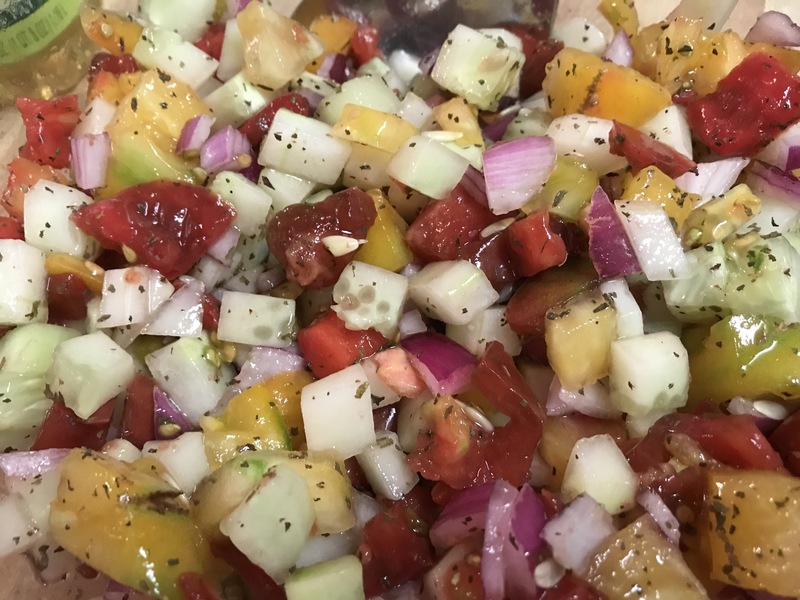 I used a “dressing” similar to one I use for a Persian tomato-cucumber salad, toasted pita and roasted lima beans – a fattoush with my own twist. And it was both yummy and satisfying. I am quite proud of this one! 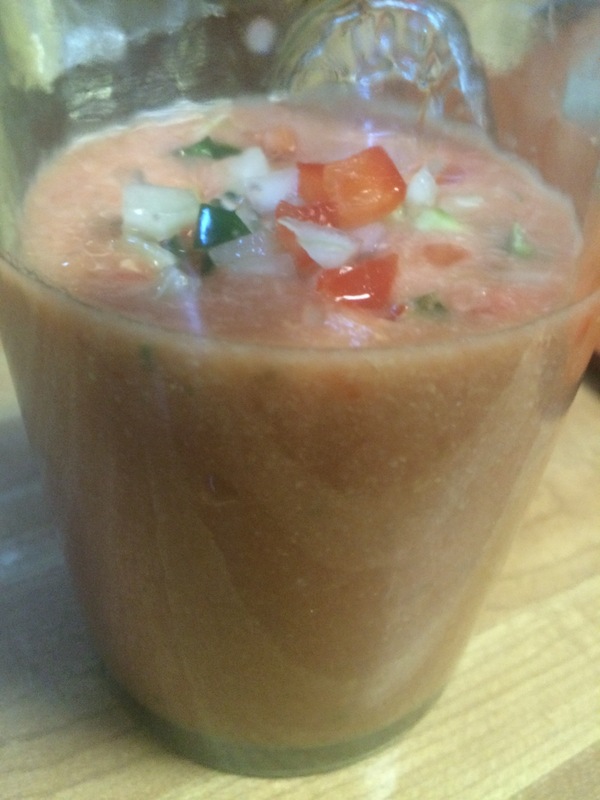 Mix the tomatoes, green pepper, cucumbers and green onions in a bowl. Break of the pitas into bite-sized pieces and add to the salad. Sprinkle the lemon juice over the top and toss. Divide the salad among the serving plates and top with roasted lima beans. Enjoy! Note: if you do not use the lima beans, you will need to add salt and parsley to the salad. The cucumbers are coming in almost faster than we can eat them, which is shocking since everyone in the house loves cucumbers. The most frustrating thing for me is that cucumbers like to hide in the garden. 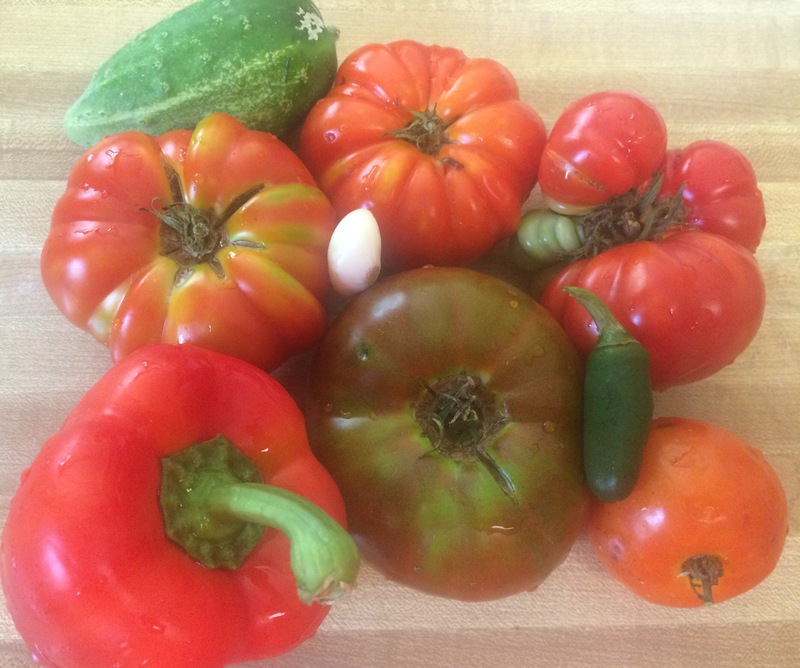 No matter how diligent I think I am in searching for cucumbers, I always end up with a few that are fatter than I like to use in a cucumber/tomato salad. 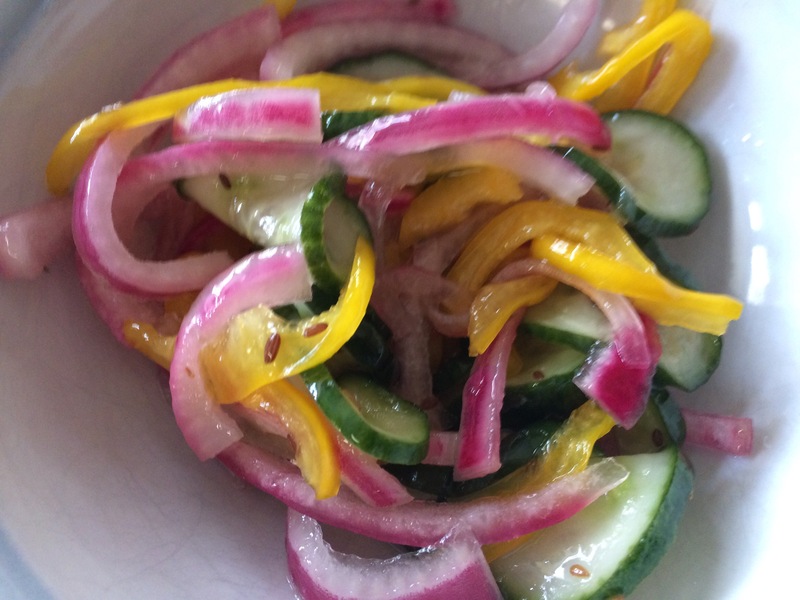 These cucumbers are great for a light, fresh pickled salad – the Cool Cucumber Salad from Better Than Peanut Butter & Jelly by Marty Mattare. It is a vegetarian cookbook aimed at foods for kids, and I have to say that when my son tasted this, he immediately asked for more. 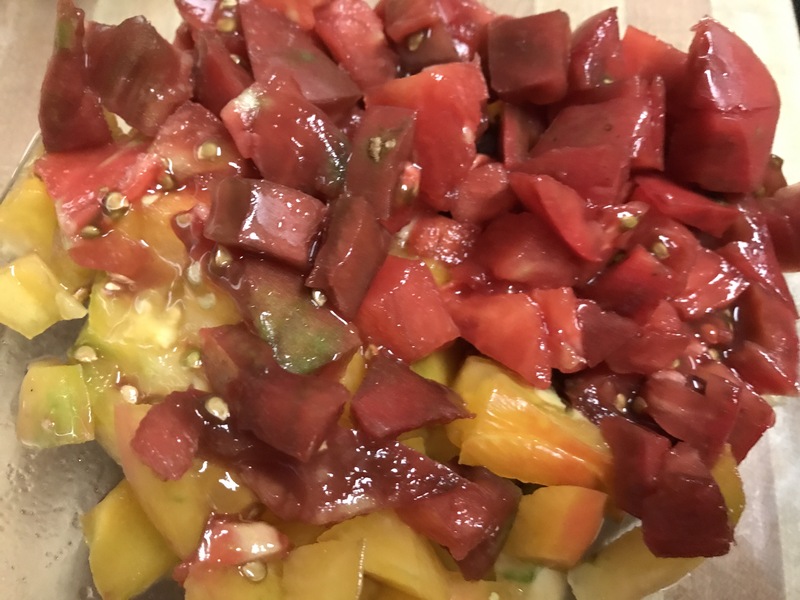 So, tonight my son had some with his fish sticks and ever-present grape tomatoes (from the garden). We had some with our Eggplant and Tomato Stew. Refrigerate for 1 hour before serving. Enjoy!